It was Saturday November 5, the first weekend after buying my new house. 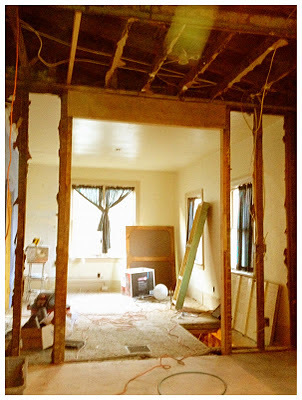 I was tearing out the old kitchen and pantry. My friend Phil came by and pointed out that I should open up the space, including losing a bedroom and moving a planned second bathroom. The design change was a great idea and once that idea was planted I wanted to do it. Little did I know, little did any of us know, that that change would set off a chain of events that would prolong the renovation and change my planned November 30 move-in date by almost 40 days and counting. IPS, my contractor, has been doing outstanding work. We are, I hope, in the final stretch. As of today, the rough carpentry and plumbing are finished. The rough electrical work is also almost finished--and hopefully will be by the scheduled inspection this coming Monday. Today we removed the final two by fours, old enough that they are actually two inches by four inches. This created an opening between the enlarged kitchen and the former bedroom which will become a dining room/living area off of the kitchen--a great room. A lot's happened in the past two months. The removal of the final two by fours today almost felt like a revelation. It was amazing what had to happen prior to taking them out. The front bedroom . . . The new laundry takes shape. The men of Integrated Property Services (IPS). A new floor in the hall and kitchen! Jake on New Year's Day in Salt Lake City.